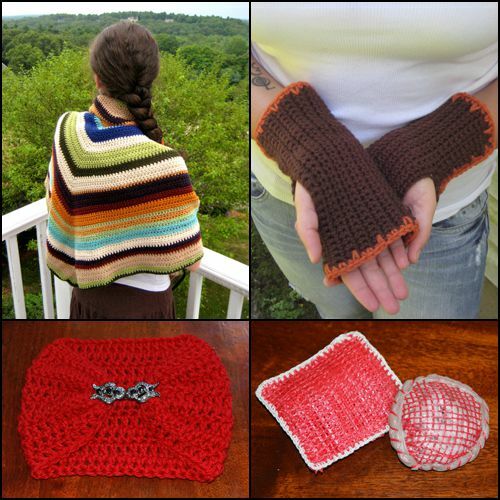 These are a few of the free crochet patterns available on our website. There are thousands more! Just scroll down to see many, many more options. It's amazing how many creative, talented, impressive designers release their patterns to use for free. You'll find no shortage of inspiration in this massive roundup of free crochet patterns. 20 Free Patterns for One-Skein Crochet Projects. Shawls, scarfs, clutches, hats, baby patterns ... this roundup has something for everyone! 10 Love-Inspired One-Skein Crochet Projects for Valentine's Day. Not all of the patterns on this list are free but many of them are so it's worth a look. The same is true for these 8 one-skein crochet patterns on the same site. 7 More One-Skein Free Crochet Patterns. This roundup is for scarves and baby projects using one skein of yarn each. 15 Most Popular Free Crochet Baby Blanket Patterns. If you're not sure about investing time in a huge blanket then you can always go for a baby blanket. They're such fun to work up. 10 Crochet Quilt Patterns. Most of the crochet patterns in this roundup of quilt-inspired blankets are free crochet patterns. Many of us want to wear skirts and dresses as soon as the weather starts to warm up. Make crochet clothing for yourself and the girls in your life using these free crochet skirt and dress patterns. 20 Popular Free Crochet Skirt Patterns for Women. These are adult-sized free crochet skirt patterns. 15 Free Crochet Dress Patterns for Women. If you're more of a dress lady than a skirt gal then check out this roundup. If you specifically like white crochet dresses then check out this list. 15 Free Girls' Crochet Dress Patterns. Crochet dresses are just adorable on little girls! 20 More Excellent Crochet Clothing Patterns. There are a lot of dresses and skirt patterns in this roundup; not all of them are free patterns but many are. There are always free crochet patterns that are so pretty that they get on trend for a while. These roundups share those most popular patterns including hexies, Attic 24 designs, chevrons, Converse, owls and more. 25 Most Popular Free Crochet Patterns. This roundup is based on Ravelry pattern rankings and includes a diverse array of different projects. 20 More Popular Free Crochet Patterns. This list includes links to crochet the African flower, Wool-Eater, blooming cushion and Swiffer covers. 10 Free Craftsy crochet patterns. This roundup is from pattern designers popular on Craftsy. 20 Best Crochet Motif Patterns. This roundup of mostly free crochet patterns if for people who love to work with squares, hearts and other motifs. Here are more lists to keep you busy with hook and yarn. 10 Free Crochet Swimsuit Patterns. Get ready for summer with this list. 10 Free Crochet Curtain Patterns. Decorate your home with these patterns. 20 Free Crochet Dishcloth Patterns. Dishcloths make great gifts and are terrific instant gratification projects. 84 Beautiful Free 2015 Crochet Patterns. The newest in free crochet patterns right here!